The germ of a cereal is the reproductive part that germinates to grow into a plant; it is the embryo of the seed. Along with bran, germ is often a by-product of the milling that produces refined grain products. Cereal grains and their components, such as wheat germ oil, rice bran oil, and maize, may be used as a source from which vegetable oil is extracted, or used directly as a food ingredient. The germ is retained as an integral part of whole-grain foods. 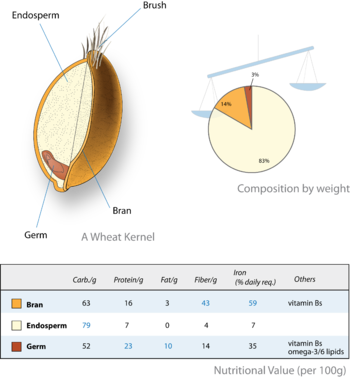 Non-whole grain methods of milling are intended to isolate the endosperm, which is ground into flour, with removal of both the husk (bran) and the germ. Removal of bran is aimed at producing a flour with a white rather than a brown color, and eliminating fiber, which reduces nutrition. The germ is rich in polyunsaturated fats (which have a tendency to oxidize and become rancid on storage) and so germ removal improves the storage qualities of flour. Wheat germ or wheatgerm is a concentrated source of several essential nutrients, including vitamin E, folate (folic acid), phosphorus, thiamin, zinc, and magnesium, as well as essential fatty acids and fatty alcohols. It is a good source of fiber. White bread is made using flour that has had the germ and bran removed. Wheat germ can be added to protein shakes, casseroles, muffins, pancakes, cereals, yogurt, smoothies, cookies, and other goods. Wheat germ can become rancid if not properly stored in a refrigerator or freezer and away from sunlight. Some manufacturers prevent rancidity by storing wheat germ in vacuum-sealed glass containers, or by placing an oxygen absorber sachet inside air-tight packaging. In molecular biology, wheat germ extract is used to carry out cell-free in vitro translation experiments since the plant embryo contains all the macromolecular components necessary for translating mRNA into amino acids but relatively low levels of its own mRNA. Wheat germ is also useful in biochemistry since it contains lectins that bind strongly to certain glycoproteins; therefore, it can be used to isolate such proteins. ^ Hui, Yiu H.; Ramesh C. Chandan; Stephanie Clark; Nanna Cross; Joannie C. Dobbs; William J. Hurst; Erika B. Smith; Leo M. Nollet; Eyal Shimoni; Nirmal Sinha (27 April 2007). Handbook of Food Products Manufacturing: Principles, Bakery, Beverages, Cereals, Cheese, Confectionary, Fats, Fruits, and Functional Foods. Wiley-Interscience. ISBN 0-470-12524-1. Retrieved 9 July 2009. There are two methods that are used for the dry-milling process: milling without removal of the cereal germ, the oldest method, and milling with removal of the cereal germ, the method most used today to ensure a better preservation. ^ Stellman, Jeanne Mager (1998). Encyclopaedia of Occupational Health and Safety. United Nations International Labour Office. ISBN 92-2-109816-8. Retrieved 9 July 2009. In addition, some maize and rice bran are used to make vegetable oil. ^ Wittenberg, Margaret M. (1 November 2007). New Good Food: Essential Ingredients for Cooking and Eating Well. Ten Speed Press. ISBN 1-58008-750-7. Retrieved 9 July 2009. Whole-grain flours are typically stone-ground or hammer-milled. Refined flours, from grains stripped of their bran and germ, must be milled with rollers. ^ McGee, Harold (2004). On Food and Cooking: the science and lore of the kitchen. Scriber. ^ "10 great health foods for eating well". Nutrition and Healthy Eating. Mayo Clinic. Retrieved 9 July 2009. ...the germ is a highly concentrated source of nutrients, including niacin, thiamin, riboflavin, vitamin E, folate, magnesium, phosphorus, potassium, iron and zinc. The germ also contains protein, fibre and some fat. ^ Weil, Andrew (7 March 2000). Eating Well for Optimum Health: The Essential Guide to Food, Diet, and Nutrition. Knopf. ISBN 0-375-40754-5. Retrieved 9 July 2009. Fibre... whole grains contain it, and wheat germ is an especially good source. ^ "Should I be eating wheat germ?". The World's Healthiest Foods. The George Mateljan Foundation. Retrieved 9 July 2009. People who choose to add wheat germ to their food often incorporate it into casseroles, muffins, and pancakes or sprinkle it over cereal or yogurt. The texture of wheat germ can add a great crunchiness and taste to these foods in a very convenient way. ^ Brody, Jane (1 January 1980). Jane Brody's Good Food Book. W. W. Norton & Company, Inc. ISBN 0-393-33188-1. Retrieved 9 July 2009. Always keep opened wheat germ in the refrigerator to prevent rancidity. ^ Ericksen, Marlene (15 June 2000). Healing with Aromatherapy. McGraw-Hill. ISBN 0-658-00382-8. Retrieved 9 July 2009. Carrier oils also turn rancid over an extended period of time and deteriorate with excess exposure to sunlight and oxygen. Most carrier oils like wheat germ... have a shelf life of eight to ten months. ^ Sawasaki, Tatsuya; Ogasawara, Tomio; Morishita, Ryo; Endo, Yaeta (12 November 2002). "A cell-free protein synthesis system for high-throughput proteomics". Proceedings of the National Academy of Sciences. 99 (23): 14652–14657. doi:10.1073/pnas.232580399. ISSN 0027-8424. PMC 137474. PMID 12409616.